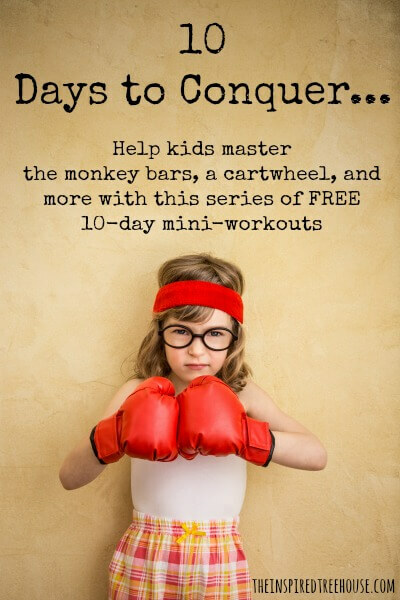 10 DAYS TO CONQUER: MINI WORKOUTS FOR KIDS! In this series of posts, you’ll find fun and simple 10-day workouts for kids to work up to a skill that they really want to master. Is your child dying to do a cartwheel? Maybe she won’t rest until she can swim the length of the pool. Or maybe he has his heart set on conquering some other skill that will get him a little cred on the playground. If so, you’re in the right place! This is what our 10 DAYS TO CONQUER series is all about! These mini workouts for kids are perfect for a therapist working with a child on one of these skills or for a parent looking to support his or her child’s development of a specific skill. Kids will love working day by day to achieve their goals. And while we can’t make any guarantees that little ones will master the skill by the end of the 10 days, we can guarantee that you and your kids will have a blast trying and that every little bit of work will get them closer and closer to their goal! Share your kids’ hard work and success with us on Facebook, Instagram, and Twitter using #10daystoconquer! Success? Hooray! Print your 10 Days to Conquer certificate here! 10 Days to Conquer the Monkey Bars! 10 Days to Conquer a Somersault! 10 Days to Conquer Clothing Fasteners! 10 Days to Conquer a Cartwheel! 10 Days to Conquer: How to Shoot a Basketball! 10 Days to Conquer the Pool!